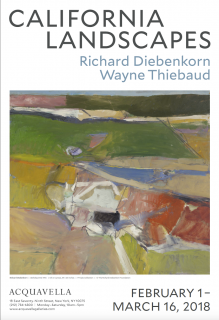 New York, NY – Acquavella Galleries is pleased to present California Landscapes: Richard Diebenkorn | Wayne Thiebaud, featuring twenty landscapes by California painters Richard Diebenkorn and Wayne Thiebaud. 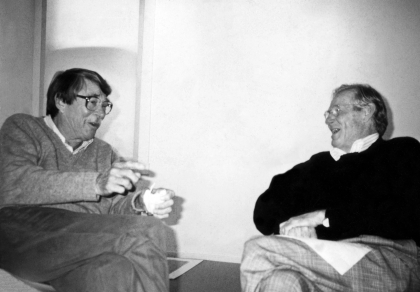 The show will mark the first joint exhibition dedicated to landscapes by these leading postwar California painters – who were also close friends. Themes explored in the show will include their use of vibrant color, painterly texture, sense of light, and aerial perspective. 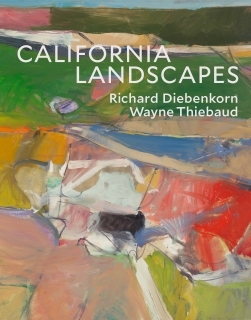 California Landscapes will include four important examples from Diebenkorn’s Berkeley series in addition to several works from the artist’s Ocean Park series. 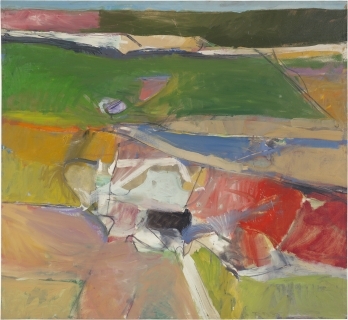 The Berkeley series, produced between 1953 and 1956, is marked by radiant color, strong compositions and gestural brushwork that maintain a sense of landscape through their abstract composition. 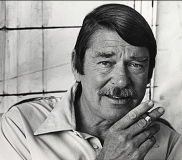 In the mid-1960s, Diebenkorn began his seminal cycle of paintings and works on paper, the Ocean Park series. Inspired by the environs of the Ocean Park neighborhood in Santa Monica where he lived at this time, the works are characterized by geometric abstractions of subtle line and suffused with Californian luminosity. 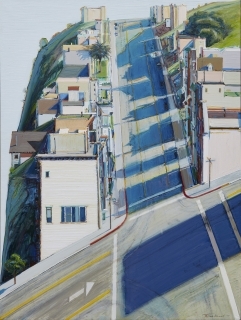 Thiebaud began producing landscapes in the 1960s, employing his characteristic exaggerated palette and meticulous painterly technique while experimenting with perspective to capture his Californian surroundings. On view will be works from the early 1970s through 2017, including his dizzying and dramatic depictions of San Francisco, flattened aerial views of the Sacramento River Delta, and unusual close-up and cross section views of mountains and beaches. A fully illustrated hardcover catalogue will accompany this exhibition and will include a critical essay by the distinguished curator and art historian John Yau. 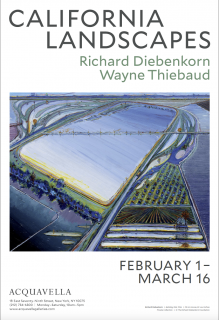 The book will also include an interview between gallery Director Philippe de Montebello and artist Wayne Thiebaud.